The Pahtodawgyi Pagoda is located in the tiny town of Mingun which lies in the Sagaing region in northwestern Burma. 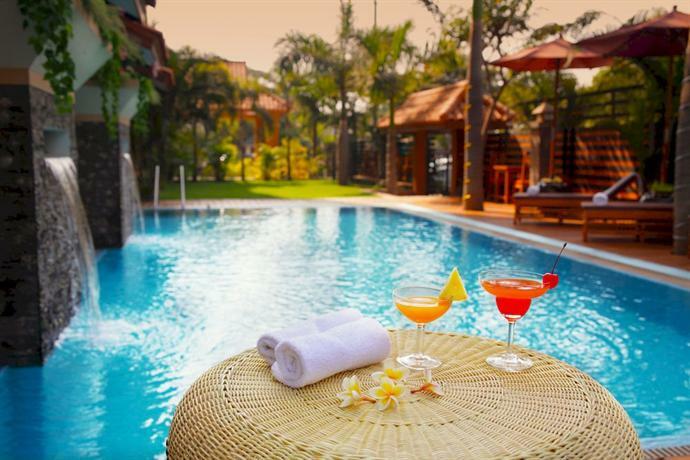 Mingun is just 7 miles away from Mandalay and can be reached in an hour by boat along the Ayeyarwady River. 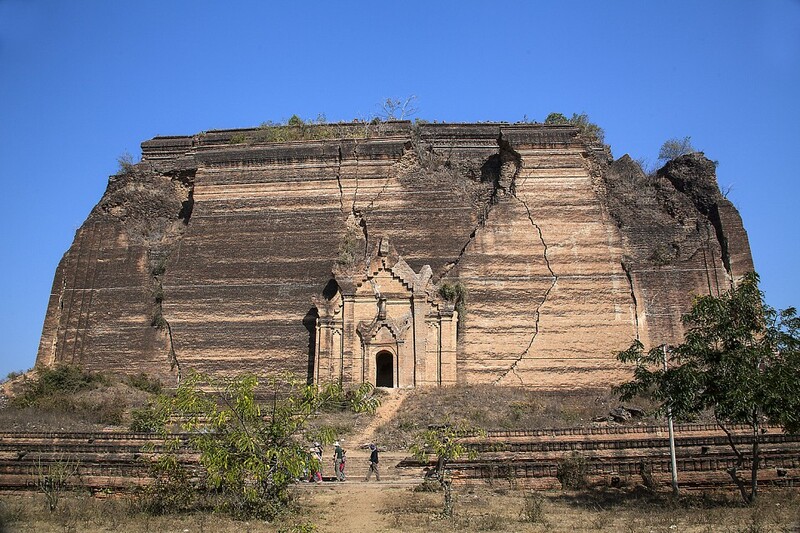 The incomplete stupa of Pahtodawgyi and its famous ringing bell are some of the major tourist attractions of Mingun Town. 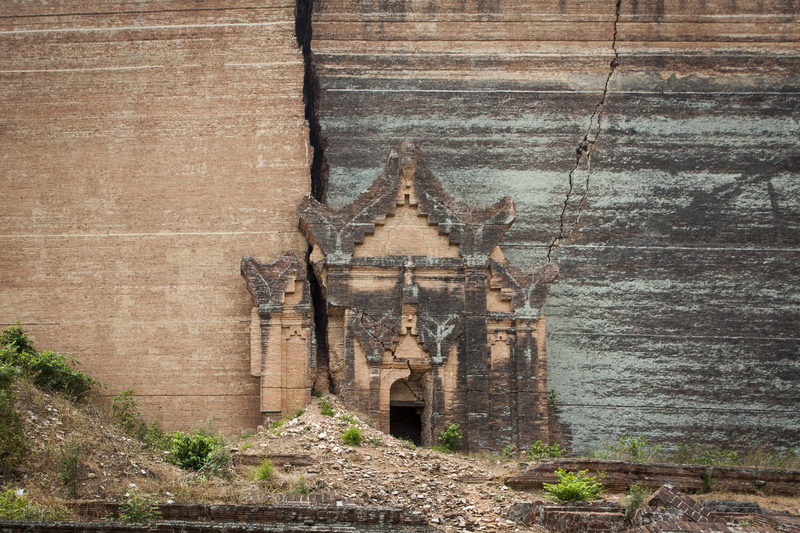 As soon as one enters the little town of Mingun, one can see the gigantic ruins of the Mingun Pahtodawgyi. Situated at a distance of 6 miles from the city of Mandalay, the ruins consist of a gigantic construction which began in 1790 during the reign of King Bodawpaya who wanted to construct the largest pagoda on Earth. 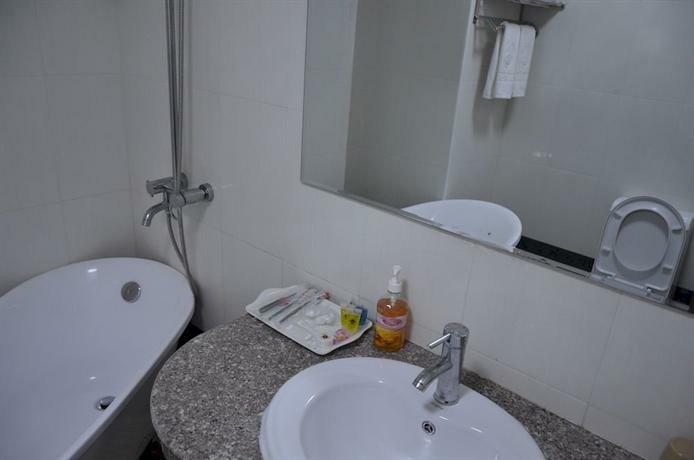 Even though he had an observation post constructed in an island near Mingun to supervise the process of the construction, the project was never completed. 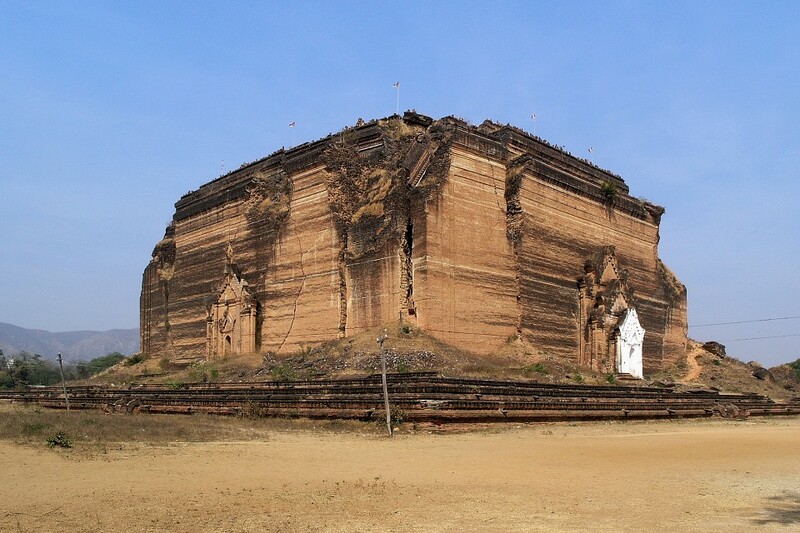 King Bodawpaya made use of thousands of war prisoners and slaves whom he acquired from his war campaigns who were employed in the construction of the stupa. 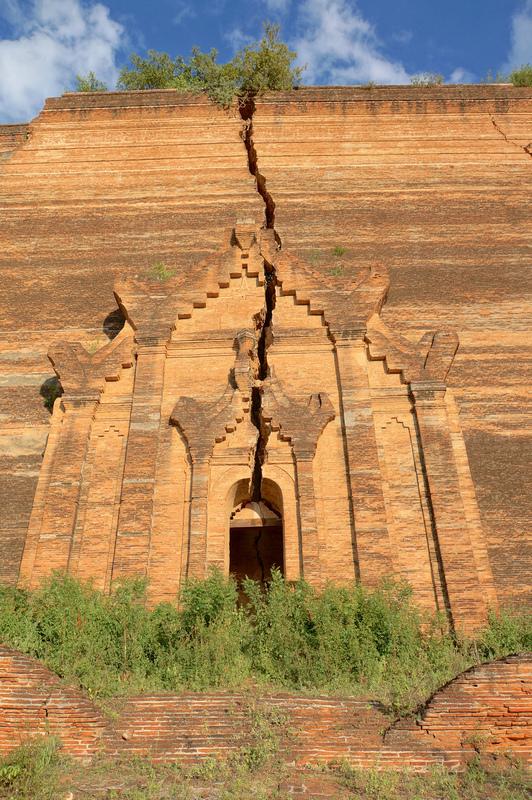 Since the construction process was taking its toll on the finances of the state, the people supposedly created a prophesy according to which as soon as the construction of the pagoda had finished, the kingdom would also perish at the same time. According to a variation of this myth, the prophesy predicted that the King of the land would die as soon as the pagoda was completed. 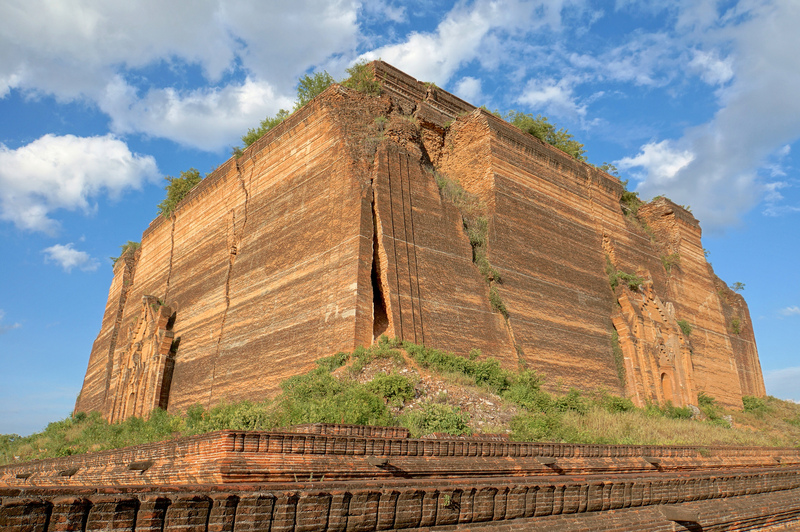 However, ruefully, Mingun Pahtodawgyi is presently famous for being one of the largest pile of stone and brickwork in the world. The unfinished pagoda rises up to a height of 164 feet which is just one third of its proposed desired height. 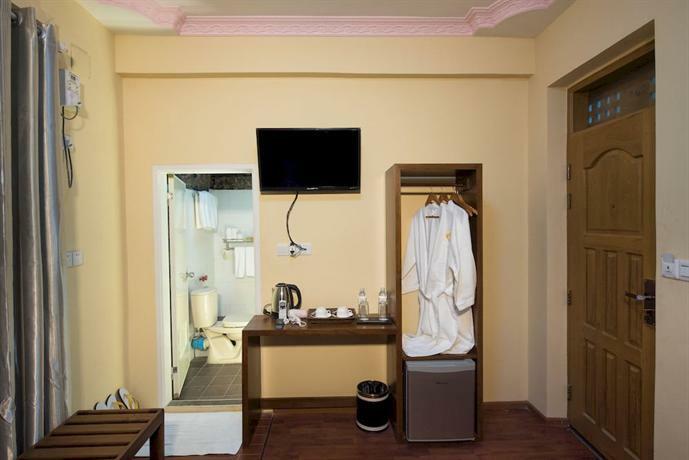 The width of the construction is about 450 square feet. An earthquake in 1839 has resulted in the appearance of huge cracks on its facade. The surrounding temples around the not-so-holy ruin doesn’t have much religious relevance but are more popular as tourist sites. However, there is a small shrine with an image of Buddha which is still used as a house of prayer near the historical landmark. Nearby one can see the working model of the Pahtodawgyi pagoda, known as Pondaw paya. There are also two gigantic statues of lions in Pahtodawgyi Pagoda. 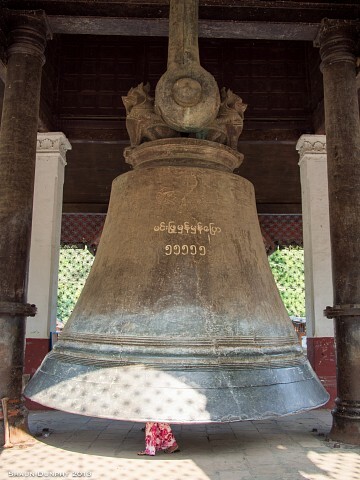 The Mingun Bell is a gigantic bell made of bronze, which was cast by King Bodawpaya to accompany the pagoda. The Mingun Bell weighs about 90 tons and is the second largest ringing bell on the planet. Pahtodawgyi pagoda offers special courses where one can study the special arts and crafts of the Kongbaung period in Burma. 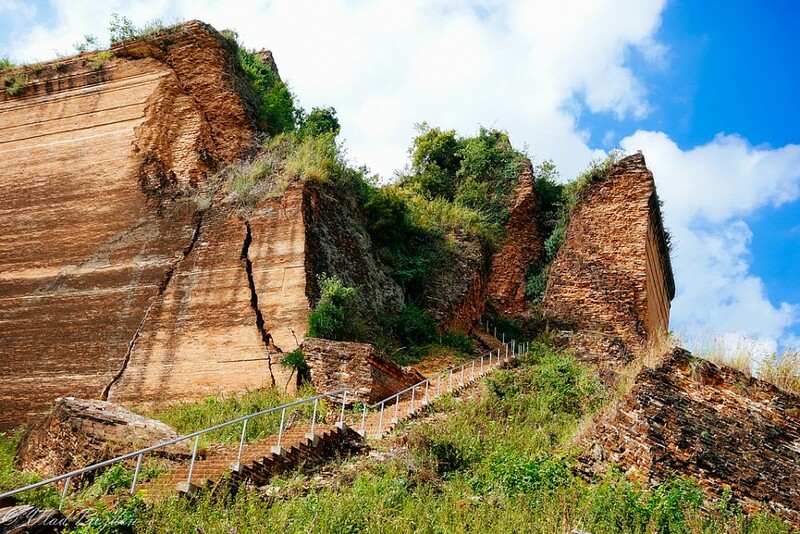 The stairways to the east of the pagoda which leads to the Ayeyarwady River is a nice place to sit and relax while enjoying a nice view of the Minwun Hills nearby. 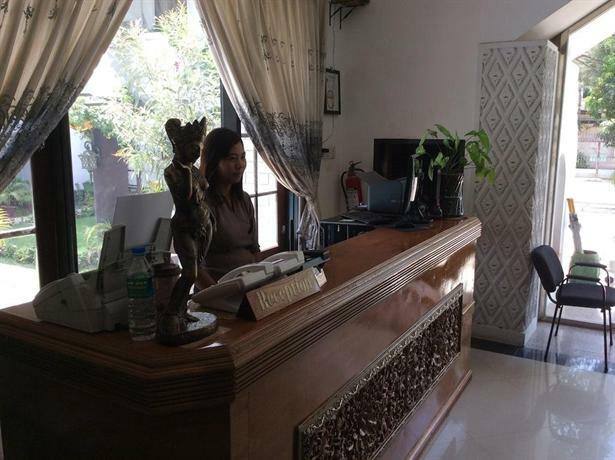 Burmese and Chinese are the principal language spoken here while English remains as a third language, spoken only by the elites of the town. 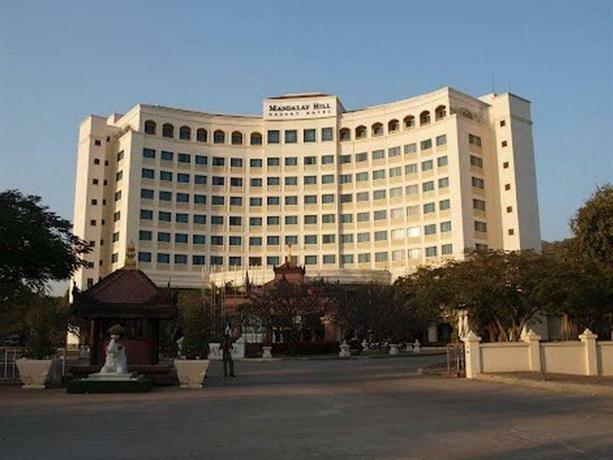 Most visitors to Mandalay make a one-day trip to the town of Mingun which can be reached in an hour from Mandalay. 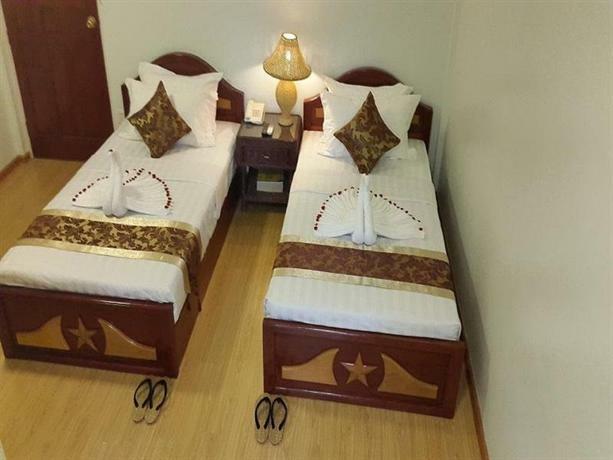 Mingun can be reached by a ferry boat or by hiring a car from Mandalay. A car takes about 45 minutes to reach while the journey by boat takes about an hour. It is suggested that you take a ferry from the Gawwein Jetty in Mandalay and enjoy a slow ride to reach the tiny town of Mingun. Apart from the Pahtodawgyi pagoda, travelers in Mingun should make sure to visit the splendid Hsinbyume Pagoda, “The Mingun Home for the Aged” which was found by Daw oo Zun in 1915 and also the Mandalay Palace and the fabulous Kuthodaw Pagoda, which is located near Mandalay City.